People born specifically on the 19th of May are predicted to be charismatic, logical deep thinkers who can be more rash and less cooperative than most bulls. The ruling astrological planet for this particular day is our Sun making you likely to be highly motivated and full of initiative with humanitarian values. If you have this birthday a mix of sharp intellect and capable independence directs you to be firm and set in your views and instinctively look to the future. You are very self assured on the surface, warm and sentimental inside but emotionally prone to be quite insecure. If your abundance of energy, leadership qualities and confidence in your abilities are well directed they can take you far in life. You love giving advice but will rarely ask for it. Individuals with a May the nineteenth birthday are usually responsible lovable communicators with the inclination to sometimes act first before thinking of the consequences. Career options can be difficult decisions to a person born on the nineteenth of May as you often have strong preferences on working environments. Despite your usual intelligence and possession of management skills a job behind a desk would be an unusual choice. You tend to much prefer more manual types of work that involve spending plenty of time outdoors or the opportunity to travel. With finances you may be a little frivolous occasionally but also fairly adept at managing a budget. You do not ordinarily feel the need to display financial success with the display of material possessions. For a Taurus, the person born on the nineteenth day of May is typical in their likelihood to make friends easily and consider friendship the best basis of personal relationships. You are an interesting, fun, generous partner but you like to take the lead in love partnerships and may have overly idealistic expectations. Loving and feeling deeply is something you seem to do naturally even though your trust in your instincts is often stronger than your reliance on emotions. In a long term relationship with a soul mate you are incredibly caring and loyal with the tendency to be enthusiastic and spontaneous regarding romance. Patient and placid you possess an energetic, lustful libido allowing you to be direct and adventurous in the bedroom. Your proneness for possessive demanding behavior materializes if your insecurities are inflamed. Disturbances of the normal robust constitution experienced by those born on May 19th are usually infrequent and shortlived. You have a mainly sensible attitude to healthiness, know your body well and keep a watchful eye on changes. One weakness you have that can affect overall health is that you sometimes let being busy alter your usual healthy choices of food. Too many convenience meals can quickly make you feel bloated and lethargic so they should ideally be avoided. People born on this day are disposed to be a tad clumsy especially when tired so getting enough sleep is beneficial and important. Your main strengths of character are recognizable in your straightforward industriousness and high levels of motivation. These favorable traits are combined with your admirable sense of responsibility and fairness giving you a calm, competent unprejudiced approach to everything. Weaknesses of personality for those born on May 19th focus on your rashness and tendencies to be once in a while too headstrong and stubborn. When the negative side to your nature is ignited can cause you to behave in a controlling, unruly and opinionated manner particularly if your feelings or pride have been hurt. Being born on the 19th of May generally gives you a realistic outlook that tends to filter into all your aspirations. It helps you understand that successful achievements for you personally are all about taking on challenges and the overcoming of obstacles and fears. You are likely to remain rather composed following failures and not let it dampen your enthusiasm and optimism. Your forward thinking often grants you the inspirations for plans in your personal life and these can feature in your dreams. Popular dream themes can frequently involve the building of emotional stability, security and contentment. As you were born on the nineteenth day of the month the total of your birth date figures generates a Root number of One. This numerical reference to your birthday has the keyword 'Drive' reflecting your determined spirit and ability to initiate actions independently. The 19th Major Arcana Tarot card closely linked to your birthday pictures the Sun and symbolizes your warmth, vitality and desire for wisdom. The luckiest jewel selected specially for May the nineteenth birthdays is imagined to be a Ruby. Wearing this gemstone promises you added assertiveness and is thought to protect against negativity. The probable characteristical qualities of Taurus personalities are believed to be strongly astrologically influenced by Venus. 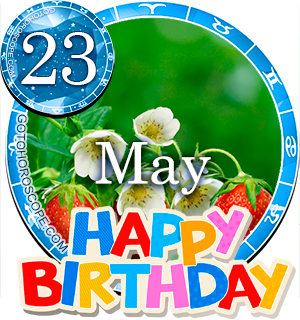 The actual day you were born on, the nineteenth of May, is however assumed dominated by the influences of a different planet, the Sun. This secondary cosmic influence on your characteristics explains your similarities to and differences from others with your zodiac sign. Your combination of charm, sentimentality and common sense accentuate your uniqueness. Your mix of analytical, independent, confident realism keep your mind and body active and stimulated. If you can learn to control your obstinate uncooperative streak it should speed up your progress in all you attempt and improve communication. An apposite final thought for people born on May the 19th also relates to one of the disadvantages of your stubbornness. This is to every now and then contemplate asking for guidance instead of offering it as this should have many advantages in knowing and understanding yourself and others better. Am so happy to meet you all my birthday mates it was boring having it all alone. looking forward for this year"s.
It's true and I am in love with a tarun guy and am born 24th September as Libra. I am not finding my relationship peaceful anymore because of his possessive and insecurity nature!! What should I do?? Its not matching even I'm also born on may 19 its not a common stake for all. Happy Belated birthday to al the May 19th people! My birthday too on 19 May the year of 1991 Good luck and may all our wishes and dreams come true. hahahaha so lucky to be born on this date happy birthday to all of us !!! Happy Birthday to us all!!!! Yes, I too, was born on the 19th. of May... Ha, it was enlightening to read this Horoscope. All those traits...hahaha, especially the stubborness, just ask my husband and soulmate of 46 years...hahaha. He's an Aries, but I think he has the traits of a Pisces :-)...just as well !!! This horoscope is so true abt me as I was born on this date (19-05-1995). Its inspirational n it gives me to change my outlook n be a better indivdual. Tanks a lot!! Hey I was born on the exact same day 19/5/1995.tell me more about you.